Provide comfort for the family of Shirley Carruthers with a meaningful gesture of sympathy. 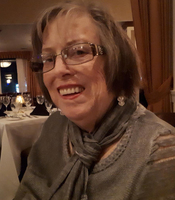 Shirley passed away peacefully at the age of 72 years with her family by her side on March 18, 2019. Shirley is survived by her loving husband and best friend of 45 years Walter, her daughter: Charmin (Eric) of White Rock, British Columbia., son: Lane of Calgary, Aberta, grandsons: Braedan (Aylla) of Lethbridge, Alberta and Brody of Bonnyville, Alberta. Honorary granddaughters: Avery and Kaylyn of Innisfail, Alberta, stepsisters: Diane Simm (Darryl) Red Deer, Alberta, Marilyn Wells of Shuswap, British Columbia, as well as aunts, cousins and numerous nieces and nephews. Shirley was predeceased by her mother: Sybil, father: Phillip, brother: Wayne and step mother Margaret. To send flowers in memory of Shirley Ann Carruthers (McTighe), please visit our Heartfelt Sympathies Store. Provide comfort for the family of Shirley Ann Carruthers (McTighe) by sending flowers.